The Gipsy Kings are a group of musicians from Arles and Montpellier in the south of France who perform in Spanish with an Andalusian accent. Although group members were born in France, their parents were mostly gitanos, Spanish Romani people who fled Catalonia during the 1930s Spanish Civil War. Chico Bouchikhi is of Moroccan and Algerian descent. They are known for bringing rumba catalana, a pop-oriented music distantly derived from traditional flamenco music, to worldwide audiences. The group originally called itself Los Reyes. Their music has a particular rumba flamenca style, with pop influences; many songs of the Gipsy Kings fit social dances, such as salsa and rumba. Their music has been described as a place where "Spanish flamenco and Romani rhapsody meet salsa funk". Career edit: The Gipsy Kings, who are from France, are largely responsible for bringing the sounds of progressive pop-oriented flamenco to a world-wide audience. The band started out in Arles, a town in southern France, during the 1970s, when brothers Nicolas and Andre Reyes, the sons of renowned flamenco artist Jose Reyes, teamed up with their cousins Jacques, Maurice, and Tonino Baliardo, themselves sons of flamenco guitarist Manitas de Plata. Manitas de Plata and Jose Reyes were a duo which had triggered the wider popularity of Gypsy Rumba. But it was famous singer Reyes who was mostly responsible for the new surge of popular interest, however, when he left Manitas de Plata and started a band of his own, made up of his own sons, which he called "Los Reyes". The band would later become "Gipsy Kings". Los Reyes started out as a gypsy band. They traveled around France, playing at weddings, festivals, and in the streets. Because they lived so much like gypsies, the band adopted the name The Gipsy Kings. Later, they were hired to add colour to upper-class parties in such places as St. Tropez. But popularity did not come quickly to the band and their first two albums attracted little notice. At this point, the Gipsies played traditional flamenco invigorated by Baliardo's precise guitar playing and Nicolas Reyes' exceptional voice. Although they had devoted fans, the Gipsy Kings then had yet to gain wider recognition. That was until 1986, when they met producer Claude Martinez, who could see that the Kings had the makings of a world-class band. The three left-handed guitarists in the Gipsy Kings' line-up play guitars that are strung for right-handers, playing them upside-down. These left-handed performers focus on delivering the strong underpinning rhythms while the more complex leads are performed by the right-handed and conventionally styled Baliardo. Success edit: They became popular with their self-titled first album, Gipsy Kings, which included the songs "Djobi Djoba" , "Bamboleo" and the romantic ballad "Un Amor". The song "Volare" on their fourth album Mosaïque is a rumba version of Domenico Modugno's Italian hit "Nel blu dipinto di blu". The Gipsy Kings were popular in Africa and throughout Europe, as well as in the Middle East. In 1989 Gipsy Kings was released in the United States and spent 40 weeks on the charts, one of few Spanish language albums to do so. The band then covered "I've Got No Strings" for the 1991 Disney video and compilation album Simply Mad About the Mouse. Their cover version of "Hotel California" was an example of fast flamenco guitar leads and rhythmic strumming, The number was featured in the Coen Brothers' movie The Big Lebowski, as well on the HBO series Entourage. The 2010 film Toy Story 3 featured a version of "You've Got a Friend in Me" performed and recorded by the band; the Spanish language version was entitled "Hay un Amigo en Mi" and was performed in a more recognisably flamenco style. Solo projects edit: Some of the individual members of the band have put out their own albums. For example in 1988 Canut Reyes released his solo project Boléro. He has since released a second solo album titled Gitano. André Reyes recorded a solo album in 1992, but never released it officially although pirated copies found it to the hands of fans and released online. Tonino Baliardo released his own instrumental album Essences in 2001 and was re-released also in 2003. Collaborations edit: This section requires expansion with: more collaborations. 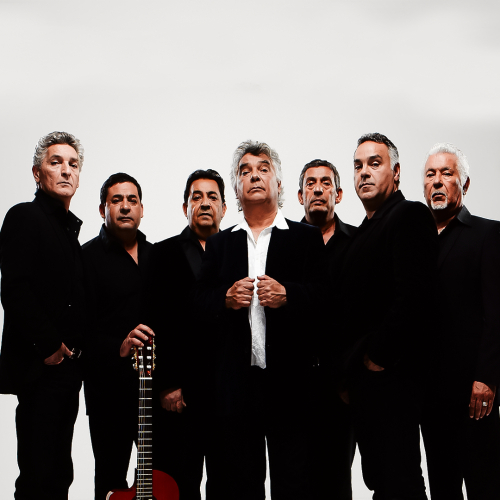 (July 2012) Gipsy Kings have had a great number of collaborations with many renowned artists. These include "Speaking of Dream" with Joan Baez in 1990), a duo of "My Way" with Francis Cabrel in 1993, version of Bob Marley's "One Love sung with his son Ziggy Marley, Georges Reyes' song "Donde esta el amor" with Nicolas Reyes in 2006. They also performed "Get Up!" with Captain Jack. Members edit: Gipsy Kings are members of two related families: the Reyes (Kings in Spanish) and the Baliardos. Nicolas, Canut, Paul, Andre and Patchai Reyes are sons of the flamenco singer Jose Reyes. The Gipsy Kings are: Nicolas Reyes: lead vocals, guitar, Paul Reyes: backup vocals, guitar, François "Canut" Reyes: backup vocals, guitar, Patchai Reyes: backup vocals, guitar, André Reyes: backup vocals, guitar, Diego Baliardo: guitar, Paco Baliardo: guitar, Tonino Baliardo: lead guitar, Jahloul "Chico" Bouchikhi was also a member of the Gipsy Kings, but quit after the album Mosaïque and the tour supporting it. He had issues with the album's producers, which the other band members did not back. Bouchikhi, a co-founder of the band, lost the Gipsy Kings trademark. (He claims to have registered it after coming up with the name.) He founded a band of his own called "Chico and the Gypsies".